Join today, pay from 01st April 2016! 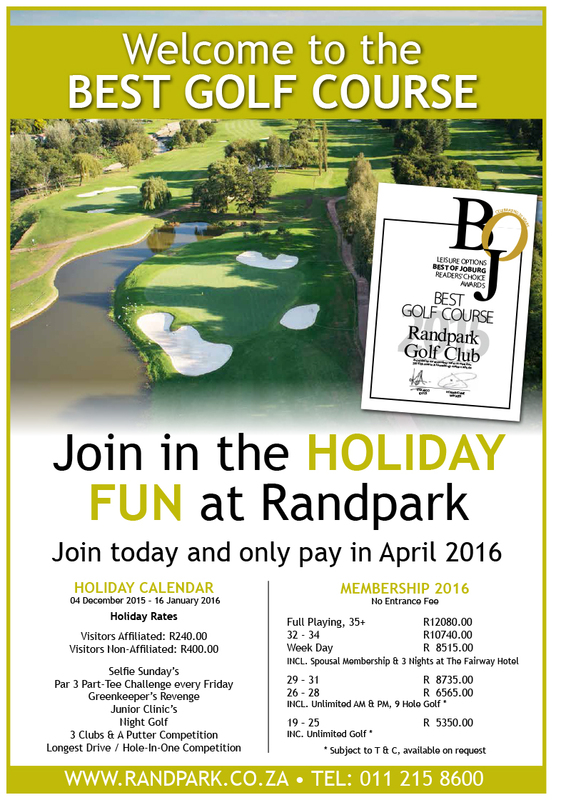 Join THE BEST GOLF CLUB today and only pay in April 2016. In the season of giving, we take great pleasure in extending a special welcome to all new Members with an unbelievable Christmas offer. Join today and only pay in April 2016! Make use of this opportunity to join The Best Golf Club in Joburg. This offer is applicable on a first come first serve basis and standard Terms & Conditions! Entrance Fee: NIL but with limited capacity! There is no better time to sign up. Full Membership and Weekday (male and female), receive three complementary nights at The Fairway Hotel valued at R7 200.00. Full and Weekday memberships also include a Spousal Membership valued at R1 200.00. All categories inclusive of Green Fees, will be required to pay for the golf portion of the offer. Enclosed herewith please find a Membership Application form for completion together with details of the entrance and annual fees applicable per category. Return the membership application form to the Club’s, Membership Administrator – Julia or to the Club’s main reception. Full and Weekday Members, remember to ask your Spouse to complete an application in order to process a complimentary Spousal Membership.